Bina007 Movie Reviews: Late review - THE ILLUSIONIST / L'ILLUSIONISTE - Will you still love a man out of time? Late review - THE ILLUSIONIST / L'ILLUSIONISTE - Will you still love a man out of time? Sylvain Chomet is a wonderfully old-fashioned animator. He still draws his characters by hand, rather than using CGI. And he uses very little dialogue, relying instead on subtle suggestion and sight-gags. The result, in BELLEVILLE RENDEZ-VOUS, was a film full of whimsy, charm and real heart. Viewers looking for that same odd-ball humour in THE ILLUSIONIST will be wrong-footed, as I was. 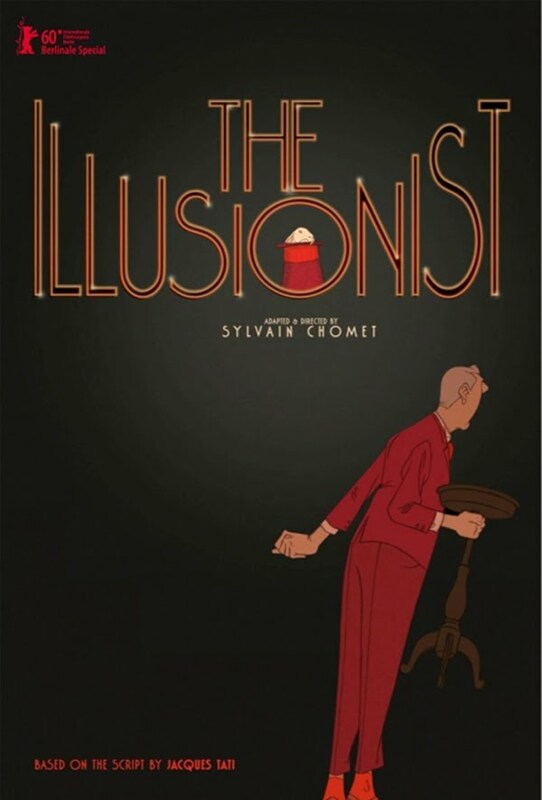 For THE ILLUSIONIST, while similar in technical style to BELLEVILLE, is quite different in tone. Whimsy and charm are replaced by a rather unrelentingly bleak and depressing feel, and while THE ILLUSIONIST is just 80 minutes long, it felt far longer because the material was tough and problematic. The movie is based on a script written by the legendary French vaudevillian and film-star, Jacques Tati. Written in the late 50s, it is the script of a man painfully aware that modern culture - the creaton of the "teenager", pop idols and film-stars - was rendering Vaudeville a dying art. As M. Hulot, his supremely popular film alter-ego, Tati had shown an anachronistic man struggling to deal with modernity in a comic light. But in his script for THE ILLUSIONIST, he confronted the true tragedy of the Man Out Of Time. It is no surprise to me that Tati never filmed THE ILLUSIONIST. It is a film so full of bleak reality - so self-negating - that it feels more like a shadowy form of therapy than a realistic project. And so it fell to Sylvain Chomet to finally bring the film to screen. THE ILLUSIONIST sees a M.Hulot magician called Tatischeff - Tati's real name - performing to small indifferent crowds in music halls now filled with teenagers screaming for pop music. He leaves Paris, and then London, in search of work, and finds himself in Mull and Iona. There, the locals are still enamoured of his tricks, although it's only a matter of time before he's obsolete there too: they applaud him, but the jukebox is being installed. So ends the pre-amble. The story really takes off when a teenage girl called Alice believes Tatischeff really is a magician, and follows him to Edinburgh. They take up together - he is perhaps trying to recreate a father-daughter relationship - and he desperately tries to maintain the illusion that he really is a magician. Tragically, the production of coins from behind her ear, or pretty dresses and shoes, requires real, degrading work that he hides from her. It is exhausting, ultimately unsatisfying, and cannot be sustained. The film - in particular its ending - makes a number of key statements - all of which are bleak. First, vaudeville is dead: the crowds that once laughed have discarded it and its artists most cruelly, with desperately tragic consequences. Second, vaudevillians gave happiness to others at a great price - the travelling deprived them of real personal relationships, and left them economically at the mercy of rapacious agents and fickle audiences. Third, that the illusions that once gave happiness can become a source of dangerous delusion, enabling a deeply damaging relationship. By the end of the film Tatischeff has realised this - all of this. Little Alice will have to struggle with these lessons after the film ends. Maybe if I'd been better primed I would have liked THE ILLUSIONIST more. I love the idea of exploring tragedy through animation. But even if I had been warned, and as much I appreciate the intention of the film, I still found it deeply problematic. The relationship between Tatischeff and Alice seemed to me sinister. It wasn't clear to me that she really thought the money appeared my magic. Rather, that she was simply playing him for money. Was she really so self-involved that she couldn't see what it was costing him? And if he could really magic money for clothes and shoes why wouldn't he magic money for rent in a better lodgings? Alice is either stupid or conniving - either way - a gaping hole where empathy should be at the heart of the film. Or maybe that was intentional? Maybe Tati wanted to show that Alice was just another example of fickle youth screaming for pop? Hard to square this with Chomet's contention that Alice is a stand-in for Tati's real-life daughter Sophie. Stylistically, I also thought there were some mis-steps. I loved the attention to detail in recreating 1960s Edinburgh, but why break the beautifully hand-drawn world? There is a scene where Tatischeff releases his white rabbit into the wild and the camera lifts up and gives us a whirling panoramic aerial view of Edinburgh. It's stunning, but it feels very CGI and quite out of keeping with the rest of the film. Overall, then, I found THE ILLUSIONIST to be a bleak, often dull, and problematic in terms of the central relationship, and occasionally the technique. A great disappointment, and greater still because the central ideas are so powerful. THE ILLUSIONIST played Berlin, Telluride and Toronto 2010 and was released earlier this year in France, the Netherlands and the UK. It opens in Turkey on October 29th; in Italy on December 3rd; and in the USA on Christmas Day.